Calling all budding triathletes and all previous TOO Team Members! To mark the 5th Anniversary of Thinking of Oscar we are once again putting together a squad for the Blenheim Palace Triathlon. Over the last four years we have raised close to £175,000 and had more than 200 people compete for Thinking of Oscar. For many in was their first foray into the world of Triathlon. We mark this occasion we are inviting everyone who has taken part previously and anyone who has been thinking about taking part to join us for what we hope will be our biggest team yet! In 2019 Blenheim have again allocated places specificially for Thinking of Oscar to set off in a wave together on Sunday 2rd June. This will be open to both individual compettors looking to swim, bike and run themselves as well as relay teams, who can split up legs as they see fit. This means if you would like to team up with some friends, family members or co-workers in order to take part you now can! This particular event welcomes a very large proportion of first timers. So if you are up for a challenge; if you are prepared to try something you never imagined you could do; if you would like to raise money and awareness for Thinking of Oscar to help children in UK hospital care, whether that’s through investments such as the vein finders, or better equipping playrooms or perhaps even funding more play specialists and other interesting technology innovations, then please consider signing up. We chose this event as one of our main fundraising initiatives for a number of reasons; Blenheim Palace is close to our home, and when our children were very small we would walk a lot with them in the beautiful grounds of the palace (which we still do with our youngest). After Oscar died we started to think about things that we could do which were outside of our own comfort zone in order to raise awareness of the charity and generate funds. Living your life without one of your children is unfathomably difficult and having friends and family give something a go which, for some, is an enormous personal stretch, continues to be a very symbolic gesture of support. This particular event welcomes a very large proportion of first timers. It is a sprint triathlon consisting of a 750 metre swim across the lake, 20km cycle ride around the grounds followed by a scenic 5km run. 750 metre swim across the lake, 20km cycle ride around the grounds followed by a scenic 5km run. The support that participants receive is incredible. Everyone who chooses to take part on behalf of Thinking of Oscar wears the team kit and this means that everyone else’s support team cheers them on as well. If you would like to join us in 2019 please get in touch. 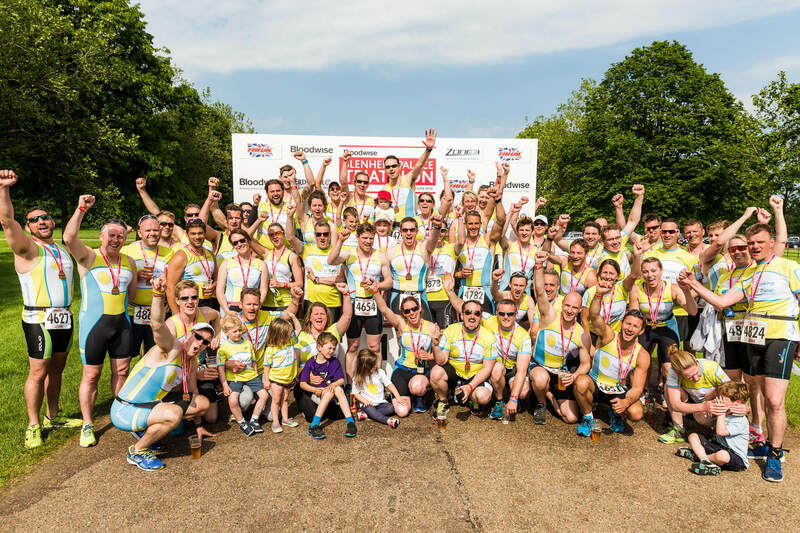 It is a really fun family day out and is your chance to do something different – or just something that you love, if you’re already a seasoned triathlete – and make a very considerable impact on our annual fundraising. The support that participants receive is incredible. We now have all the registration details from Blenheim so if you would like to sign up then please use the form below to register your interest. If you would like to register a team then please highlight this in the comments section below.